IIPL has been working diligently with its research partner Indian Center of Internet and Society (CIS) on the Issues in Mobile Internet and Access to Knowledge. The joint project has been going for two years. A couple of research exchanges, in-person meetings or virtual calls, have been arranged. Both parties have been working on four chapters on copyright, licensing, patent and anti-trust related issues on the Mobile Internet respectively in Chinese and Indian legal environment. A comprehensive review meeting was held at end of February 2017 in Macau, with the support of local research institutions. 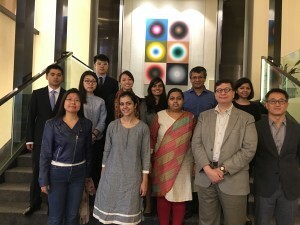 At the review meeting, both Chinese and Indian researchers of each chapter made the in-depth presentation on research methodology, progress and outlines of the contents. Prof. Xue presented, on behalf of the Chinese team, on all four chapters that have been working on from the Chinese side. 7 India young researchers presented respectively the chapters from the Indian side. International experts from Canada ICTSD and USA were invited to review the research and highly acknowledged the quality and value of the outputs. Four pairs of the chapters from both countries showcase the very interesting landscape and potential of mobile Internet in two biggest Internet communities in the world. Both opportunities and caveats emerge from these research outputs. The upcoming comparative studies will be even more inspiring. The research is an epic one in both countries as well as in the whole world. Its final product will be an importance contribution to the research on the Internet 2.0 that is community-based, social-media centered and ubiquitous on wireless network. The two partners is going to present its research achievements to the regional community at the APrIGF at the end of July 2017.